“Biochemical genetics” redirects here. For the scientific journal, see Biochemical Genetics. …not so much a technique as an approach, an approach from the viewpoint of the so-called basic sciences with the leading idea of searching below the large-scale manifestations of classical biology for the corresponding molecular plan. It is concerned particularly with the forms of biological molecules and […] is predominantly three-dimensional and structural – which does not mean, however, that it is merely a refinement of morphology. It must at the same time inquire into genesis and function. Genetics is the study of the effect of genetic differences in organisms. This can often be inferred by the absence of a normal component (e.g. one gene). The study of “mutants” – organisms which lack one or more functional components with respect to the so-called “wild type” or normal phenotype. Genetic interactions (epistasis) can often confound simple interpretations of such “knockout” studies. Much of molecular biology is quantitative, and recently much work has been done at its interface with computer science in bioinformatics and computational biology. In the early 2000s, the study of gene structure and function, molecular genetics, has been among the most prominent sub-fields of molecular biology. 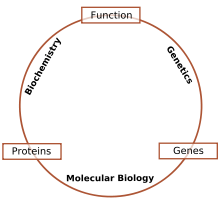 Increasingly many other areas of biology focus on molecules, either directly studying interactions in their own right such as in cell biology and developmental biology, or indirectly, where molecular techniques are used to infer historical attributes of populations or species, as in fields in evolutionary biology such as population genetics and phylogenetics. There is also a long tradition of studying biomolecules “from the ground up” in biophysics. For more extensive list on protein methods, see protein methods. For more extensive list on nucleic acid methods, see nucleic acid methods. One of the most basic techniques of molecular biology to study protein function is molecular cloning. In this technique, DNA coding for a protein of interest is cloned using polymerase chain reaction (PCR), and/or restriction enzymes into a plasmid (expression vector). A vector has 3 distinctive features: an origin of replication, a multiple cloning site (MCS), and a selective marker usually antibiotic resistance. Located upstream of the multiple cloning site are the promoter regions and the transcription start site which regulate the expression of cloned gene. This plasmid can be inserted into either bacterial or animal cells. Introducing DNA into bacterial cells can be done by transformation via uptake of naked DNA, conjugation via cell-cell contact or by transduction via viral vector. Introducing DNA into eukaryotic cells, such as animal cells, by physical or chemical means is called transfection. Several different transfection techniques are available, such as calcium phosphate transfection, electroporation, microinjection and liposome transfection. The plasmid may be integrated into the genome, resulting in a stable transfection, or may remain independent of the genome, called transient transfection. The terms northern, western and eastern blotting are derived from what initially was a molecular biology joke that played on the term Southern blotting, after the technique described by Edwin Southern for the hybridisation of blotted DNA. Patricia Thomas, developer of the RNA blot which then became known as the northern blot, actually didn’t use the term. A DNA microarray is a collection of spots attached to a solid support such as a microscope slide where each spot contains one or more single-stranded DNA oligonucleotide fragments. Arrays make it possible to put down large quantities of very small (100 micrometre diameter) spots on a single slide. Each spot has a DNA fragment molecule that is complementary to a single DNA sequence. A variation of this technique allows the gene expression of an organism at a particular stage in development to be qualified (expression profiling). In this technique the RNA in a tissue is isolated and converted to labeled complementary DNA (cDNA). This cDNA is then hybridized to the fragments on the array and visualization of the hybridization can be done. Since multiple arrays can be made with exactly the same position of fragments they are particularly useful for comparing the gene expression of two different tissues, such as a healthy and cancerous tissue. Also, one can measure what genes are expressed and how that expression changes with time or with other factors. 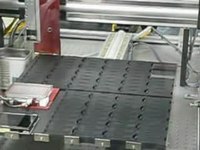 There are many different ways to fabricate microarrays; the most common are silicon chips, microscope slides with spots of ~100 micrometre diameter, custom arrays, and arrays with larger spots on porous membranes (macroarrays). There can be anywhere from 100 spots to more than 10,000 on a given array. Arrays can also be made with molecules other than DNA. Allele-specific oligonucleotide (ASO) is a technique that allows detection of single base mutations without the need for PCR or gel electrophoresis. Short (20–25 nucleotides in length), labeled probes are exposed to the non-fragmented target DNA, hybridization occurs with high specificity due to the short length of the probes and even a single base change will hinder hybridization. The target DNA is then washed and the labeled probes that didn’t hybridize are removed. The target DNA is then analyzed for the presence of the probe via radioactivity or fluorescence. In this experiment, as in most molecular biology techniques, a control must be used to ensure successful experimentation. Astbury, W.T. (1961). “Molecular Biology or Ultrastructural Biology?” (PDF). Nature. 190 (4781): 1124. Bibcode:1961Natur.190.1124A. doi:10.1038/1901124a0. PMID 13684868. Retrieved 2008-08-04. ^ Reference, Genetics Home. “Help Me Understand Genetics”. Genetics Home Reference. Retrieved 31 December 2016. ^ Lessard, Juliane C. (1 January 2013). Molecular cloning. Methods in Enzymology. 529. pp. 85–98. doi:10.1016/B978-0-12-418687-3.00007-0. ISBN 978-0-12-418687-3. ISSN 1557-7988. PMID 24011038. (Subscription required (help)). ^ “Polymerase Chain Reaction (PCR)”. www.ncbi.nlm.nih.gov. Retrieved 31 December 2016. ^ “Polymerase Chain Reaction (PCR) Fact Sheet”. National Human Genome Research Institute (NHGRI). Retrieved 31 December 2016. ^ Lee, Pei Yun; Costumbrado, John; Hsu, Chih-Yuan; Kim, Yong Hoon (20 April 2012). 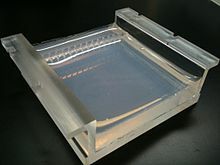 “Agarose Gel Electrophoresis for the Separation of DNA Fragments”. Journal of Visualized Experiments (62). doi:10.3791/3923. ISSN 1940-087X. PMC 4846332. PMID 22546956. ^ Thomas, P.S. (1980). “Hybridization of denatured RNA and small DNA fragments transferred to nitrocellulose”. PNAS. 77 (9): 5201–5205. Bibcode:1980PNAS…77.5201T. doi:10.1073/pnas.77.9.5201. ISSN 1091-6490. PMC 350025. PMID 6159641. ^ Brown, T. (1 May 2001). Southern blotting. Current Protocols in Immunology. Chapter 10. pp. Unit 10.6A. doi:10.1002/0471142735.im1006as06. ISBN 978-0-471-14273-7. ISSN 1934-368X. PMID 18432697. (Subscription required (help)). ^ Nielsen, Henrik, ed. (2011). RNA methods and protocols. Methods in Molecular Biology. 703. New York: Humana Press. pp. 87–105. doi:10.1007/978-1-59745-248-9_7. ISBN 978-1-59745-248-9. PMID 21125485. (Subscription required (help)). ^ Mahmood, Tahrin; Yang, Ping-Chang (2016-12-31). “Western Blot: Technique, Theory, and Trouble Shooting”. North American Journal of Medical Sciences. 4 (9): 429–434. doi:10.4103/1947-2714.100998. ISSN 2250-1541. PMC 3456489. PMID 23050259. ^ Thomas, S.; Thirumalapura, N.; Crossley, E. C.; Ismail, N.; Walker, D. H (1 June 2009). “Antigenic protein modifications in Ehrlichia”. Parasite Immunology. 31 (6): 296–303. doi:10.1111/j.1365-3024.2009.01099.x. ISSN 1365-3024. PMC 2731653. PMID 19493209. ^ “Microarrays”. www.ncbi.nlm.nih.gov. Retrieved 31 December 2016. ^ Bumgarner, Roger (31 December 2016). Frederick M. Ausubel; et al., eds. “DNA microarrays: Types, Applications and their future”. Current protocols in molecular biology. Chapter 22, Unit–22.1. doi:10.1002/0471142727.mb2201s101. ISBN 978-0-471-14272-0. ISSN 1934-3639. PMC 4011503. PMID 23288464. ^ Govindarajan, Rajeshwar; Duraiyan, Jeyapradha; Kaliyappan, Karunakaran; Palanisamy, Murugesan (31 December 2016). “Microarray and its applications”. Journal of Pharmacy & Bioallied Sciences. 4 (Suppl 2): S310–S312. doi:10.4103/0975-7406.100283. ISSN 0976-4879. PMC 3467903. PMID 23066278. ^ Tarca, Adi L.; Romero, Roberto; Draghici, Sorin (31 December 2016). “Analysis of microarray experiments of gene expression profiling”. American Journal of Obstetrics and Gynecology. 195 (2): 373–388. doi:10.1016/j.ajog.2006.07.001. ISSN 0002-9378. PMC 2435252. PMID 16890548. ^ Weaver, Warren (6 November 1970). “Molecular Biology: Origin of the Term”. Science. 170 (3958): 581–582. doi:10.1126/science.170.3958.581-a. Retrieved 31 December 2016. ^ Bynum, William (1 February 1999). “A History of Molecular Biology”. Nature Medicine. 5 (2): 140. doi:10.1038/5498. ISSN 1078-8956. Retrieved 31 December 2016. (Subscription required (help)). Rodgers, M. The Pandora’s box congress. Rolling Stone 189, 37–77 (1975).